“Ialorixa”, is from my “BAHIA !” series. She is a Mae de Santo (Mother of the Saints), performing a ritual during the Festival of Yemanja in Salvador, Brazil. The seriousness of her persona is what captured me and what I tried to portray. 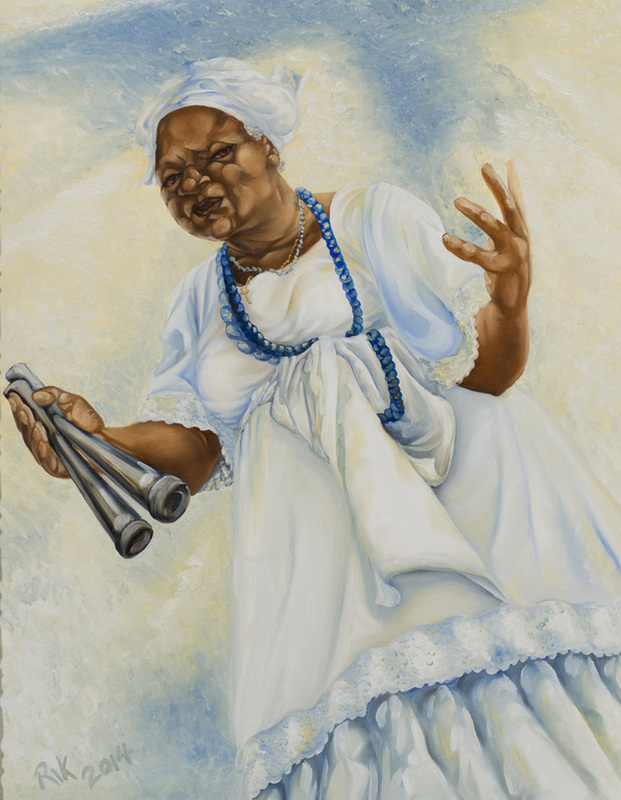 The paintings I'm presenting are from my series "BAHIA ! ", based on the Afro Bahian contribution to Brazilian culture and history. Which forms the nexus of Brazilian Carnaval, which began in the Black neighborhoods (favelas) of Rio by former Black slaves and their descendants who migrated from Bahia. It is this northern State and it's capitol Salvador, also the colonial capital of Brazil, where the roots of samba grew from lundu a music played by African slaves. For me there is a certain complexity of connectivity of all things Brazilian from lundu to samba, to candomble and capoeira, the foods moquecas, feijoda, and acaraje, the synchrontism between Catholic Saints and Candomble Orixas, the European guitar and African drum, all ingredients to carnaval. how beautiful and simply complex you are ! Rik began his artistic career in Wash., DC in 1989 as a muralist, and was recently awarded the commission for Barry Farms Recreation Center, in 2012 he was honored with the commission of "A Libertade de Maria Felipa" for the library in Itaparica, Bahia - Brazil. Rik has been featured in numerous group exhibitions, and his series "The Chittlin Circuit Review", which is based on the early history of Blues Music toured from 2008 - 11 to 7 venues in 7 States. His current series, "BAHIA ! ", based on the Afro Bahian contribution to Brazilian culture and history was greatly inspired by his residencies in Itaparica, Brazil. The recipient of several awards and honors, most recently with his 2nd residency at Instituto Sacatar, an Artist Fellowship from DC Commission of the Arts, and the East of the River Distinguished Artist Award. Rik attended the Univ. of GA, and Savannah State College where he majored in painting.